Scythe is a 1 to 5 player game set in an alternative 1920s, where various factions in Eastern Europe vie for survival by harvesting resources, building structure and Mechs, or gaining entry to the mysterious factory at the centre of the board. Players take it in turns to use an action, such as move, produce, trade or bolster. Players have player cards which tell them the costs of said actions and give them a choice in potential outcomes. Then, if the players can pay the cost of the second action on their player board in the same column, they can take that action too. Player actions can also be upgraded to become more efficient, meaning that the game is driven by choice and strategy rather than random outcomes. There are 5 named factions to choose from in the starter box, though there are 7 starter locations as there is an expansion to have up to seven players. My faction was the Crimean Khanate, and the player board I had was “Mechanical”. The named factions have special abilities, the Khanate had the ability to trade one combat card in per turn to gain one resource of any type which I would assume narratively means that my people were raiders. As the mechanical faction, I could use a bolster action (cost 1 money) to gain 2 combat cards and then build a mech if I had sufficient resources. At the start of the game, that was 3 metal, though with upgrades my mechs would only cost 1. I upgraded to the point they cost two metal and was happy with that. As an added bonus, building a mech also earned me 2 money. Resource production is a core part of the game, and each region on the map has one of 5 different resources. Food, Wood, Metal, Oil and People. If you use a produce action, by default 2 workers can harvest one resource each on a square they control. If you produce in a village, well, that means you have more workers for future turns. The different resources are used to trigger different abilities. Oil for upgrades, metal for building mechs, wood for buildings and food for enlistment. Mechs are a huge part of the game, and each faction has 4 of them. They are all basically they same, though each faction has a different miniature sculpt for it. Each faction has a named character as a leader type. Each miniature is a person and their animal companion, which I thought was pretty awesome. Characters are used in combat, random encounters and to unlock the abilities of the “Factory”. Otherwise they are just one more piece on the board. One of the things I really liked about this game was the lack of randomness. Combat was resolved not with a dice roll, but with bids of power and combat cards. So, you could spend your time building your combat power as a choice, rather than relying on random chance. And, despite playing for two hours plus (we were learning the game) there was actually only one combat. This is apparently intentional. The game is more about the threat of combat, with the presence of mechs serving as deterrents. However, we were learning the game so I held no malice for the player who decided to find out how the combat system worked by attacking me. As he should bare no malice towards me for executing one of my mech special abilities, stealing his highest combat card and beating him. I briefly mentioned characters and encounters. Some tiles on the board have random encounters, whereby you draw a card from the encounter deck and resolve one of the three options. I only did this once, however it was beneficial and the artwork on the encounter card was awesome. Each turn was remarkably quick, which I was surprised at. The game felt really involved but flowed really well and was very intuitive. It didn’t take me long to get the hang of it, and start formulating my strategy. I am pleased to say, I was the only player who managed to activate the factory, which effectively unlocks a 5th type of action that you can choose. It was expensive but really powerful. In the end, myself and the owner’s husband tied for first and he won the second tie breaker, so I came second.. I look forward to playing it again in the near future to see what else I can discover about it. Another plus for this game is the production quality. Each faction board has slots for all your components, with amazing quality artwork. The encounter cards look like art from the 19th century depicting scenes from Europe, albeit many of which have Mechs in the background, looming as ominous silhouettes. 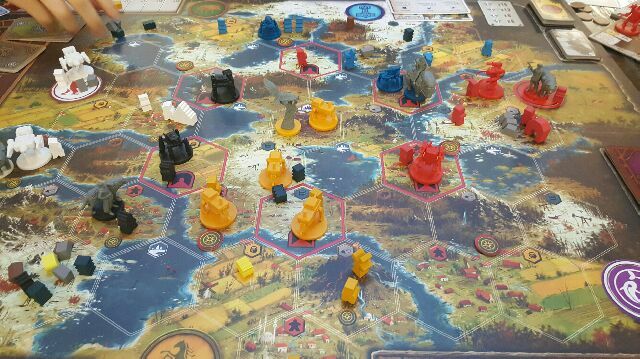 Scythe is an amazing game, that feels as involved as Twilight Imperium but runs as fluidly as Pandemic. A Worthy addition to any collection and a game that can be played solo or with friends. My friends and I spied this game a while ago when it was still in the crowdfunding stage. Going to have to pick it up if it’s as good as you say! It definitely is and there is an expansion out later this year introducing flying machines. I may get that.. Thanks. Persevere with the rules. Once you get your head round them it’s fairly straightforward. Enjoy!